For its annual exploration of music from the Peterhouse partbooks, copied in 1541 for Canterbury Cathedral, Blue Heron returns to one of its favorite masses, which will be recorded subsequently for world premiere release on CD. A festive program of music for Advent and Christmas from 15th-century England, including motets by Leonel Power and John Dunstaple, English carols, and Sarum plainchant. A musical valentine: 16th-century madrigals setting the poetry of Petrarch, by Arcadelt, Willaert, Rore, Wert, Marenzio & others. Music of 16th-century Spain, featuring Alonso Lobo's Missa Simile est regnum caelorum, based on a motet by Francisco Guerrero. FREE PARKING for Cambridge concerts! 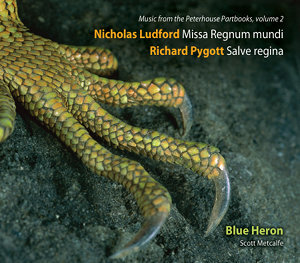 The second installment in Blue Heron's 5-CD series of Music from the Peterhouse Partbooks features Nicholas Ludford's radiant Missa Regnum mundi, sung in a musical context like that of its probable original occasion, a festal mass for St Margaret, with plainchant items from the Proper according to the Use of Salisbury. The disc concludes with Richard Pygott's extraordinary Salve regina, one of the longest votive antiphons extant and a marvel of rhetorical expression. This is the world premiere recording of all the music on the disc. Digital tracks and CDs now available online! You can now preview and purchase individual tracks or entire CDs online, in MP3 or other formats. Blue Heron announces a 5-recording series of international significance: Music from the Peterhouse Partbooks, the premiere recordings of a vital but neglected repertoire from the golden age of English cathedral music. Blue Heron in The New Yorker! The New Yorker (January 10, 2011) included an article by Alex Ross on recent trends in the performance of Renaissance polyphony, featuring Blue Heron's CD of music by Hugh Aston. Visit Blue Heron on YouTube, MySpace and Facebook! 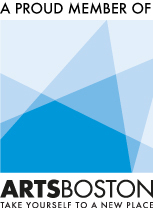 Blue Heron is proud to be a member of the Early Music America touring roster.